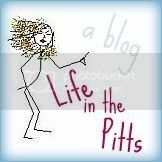 Life in the Pitts: What's new? Just found this blog and as a Penguins fan (maybe you are maybe you aren't) and dad side writer of everything thought this would be a great blog to follow. Keep it up. Shoot...that comment, up there ~ yup, that was me, I always forget to log out of that other account and it is for some scrappy design team stuff I am doing....SORRY!!! !